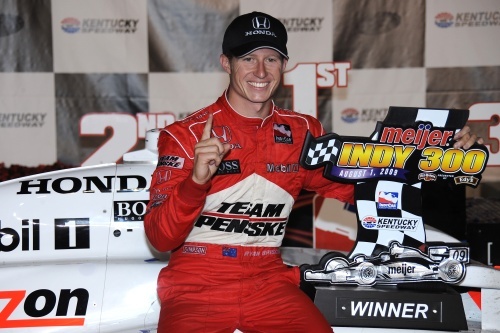 Ryan Briscoe took his second win of the Indy Racing League season at the Kentucky Speedway on Saturday. The BRDC Full Member has now moved to the head of the points standings as Dario Franchitti finished in sixth place. The other BRDC Full Members out on track were Dan Wheldon, who was 11th plus Mike Conway and Justin Wilson who finished in 17th and 21st respectively. Darren Turner finished fifth in Saturday’s Algarve 1000km, the first ever night race for the Le Mans Series in Portugal. The BRDC Full-Member qualified the Aston Martin LMP1 car in fifth place but was third behind the wheel in the race with co-drivers Miguel Ramos and Harold Primat taking the first three stints. Darren took the chequered flag in fifth, just missing out on fourth place. There were two Full Member podiums in the GT2 with Rob Bell taking the victory and Tim Mullen recorded a third place in the GT2 standings. Danny Watts did not finish the race. There were six podiums for BRDC Members at Snetterton including a win for Colin Turkington, as the HiQ MSA British Touring Car Championship returned to action following its summer break, . Race one was incident packed, including a first-lap incident between BRDC Full Members Jason Plato and Colin Turkington. Mat Jackson finished in second place ahead of fellow BRDC Full Member Paul O’Neill in the sunshine.co.uk Honda Integra with Colin fifth just ahead of Team RAC team-mate Stephen Jelley. Mat Neal was the next highest finishing BRDC Full Member in ninth with Tom Chilton in 11th for Team Aon. Non-finishers included the BRDC Full Member trio of James Thompson, Gordon Shedden and Jason Plato. In the second race Colin Turkington was second just ahead of Jason Plato and James Thompson who had both stormed from the back of the grid at the start of the race. In fifth place was Paul O’Neill while Gordon Shedden was the next highest BRDC finisher in tenth. Stephen Jelley was 13th just ahead of VX Racing’s Matt Neal, while Mat Jackson and Tom Chilton were both non-finishers. In the final race of the day Colin Turkington was promoted to the top spot of the podium after provisional winner James Nash was excluded from the race results for an early incident with Rob Collard. Matt Neal was in turn moved up a place to hand him third place while James Thompson and a very happy Paul O’Neill took fifth and sixth respectively. Gordon Shedden finished the final race in the SEAT Leon in 12th while Jason Plato finished down in 13th after picking up a puncture and had to pit, which left him a lap down on the leaders. Tim Harvey took a double victory at Snetterton yesterday in the Porsche Carrera Cup GB for Red Line Racing. Michael Caine had a mixed day, recording a fourth place in race one while he was a non finisher in race two. BRDC Full Member Jonathan Kennard was at Donington Park with the Superleague over the weekend. Sporting the colours of AS Roma, the 24-year-old finished the 45 minute race in seventh place. James Walker was the highest placed BRDC Full Member in the first Formula Renault 3.5 race of the weekend in Portimao finishing in sixth place. Race two saw the P1 Motorsport driver finish in eighth. Fairuz Fauzy finished the first race in eighth place while race two saw him finish in 20th. Sam Bird recorded a 12th place finish in the first Formula 3 Euro Series race of the weekend atOschersleben last weekend. In race two at the German circuit, Sam finished 13th. Ben Clucas finished eighth in the MSVR Speed three hour race at Brands Hatch on Saturday. Ben, in a Norma Sports Prototype had gambled on a wet tyre choice with a half wet / half dry track but the team soon pitted to change to slicks.